Rather than the heavy-scoring affairs in which Melrose have been involved so far this season, head coach Rob Chrystie reckons Saturday’s clash with Ayr will be very close. The Borders men travel to Millbrae to take on possibly their greatest adversaries at this early stage of the BT Premiership race. 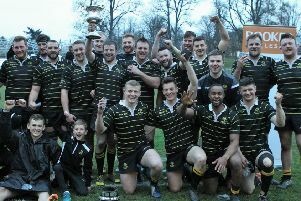 The west coast men proved to be the Greenyards outfit’s principal rivals in last season’s campaign, losing out to them in the Scottish Cup final but just pipping them to the Premiership flag after the play-offs. Melrose have amassed over 100 points in just two league games so far, against Watsonians and Boroughmuir. However, Chrystie doesn’t quite anticipate another half century-plus tally this time, although it would be nice. With both sides’ habit of occupying the top of the table recently and competing for things, it was a good early test of their 2017-18 campaign mettle. “The boys are confident now,” said Chrystie. “They have scored over 100 points in two games, which is great. But the good thing about our group is they understand what it takes to get to there. Ayr, perhaps uncharacteristically, only scraped by at Boroughmuir and then suffered a rare defeat back at Millbrae, going down 18-28 last weekend to local rivals Glasgow Hawks. “They will be hurting and, as happens with teams, that sharpens you up a little bit,” said Chrystie, knowing Ayr would want to do well against Melrose. Nick Beavan will miss the game with a back strain, but Melrose are pretty much otherwise at peak strength.